Anglers fishing Sarasota Florida have many opportunities. Sarasota offers good fishing inshore, along the beaches, and offshore. Many different species are caught using a variety of techniques. Sarasota is a resort town on the West Coast of Florida. It sits between Tampa/St. Pete and Fort Myers. Siesta Key in Sarasota is famous for its beaches. While Sarasota is not an angling destination, it does offer excellent fishing. Snook, redfish, speckled trout, and other species are caught inshore. False albacore, mackerel, and giant tarpon are caught along the beaches. Grouper and snapper are prized offshore catches. Anglers fishing Sarasota Florida have several choices when it comes to how they are going to fish. Fishing from the beach are sure is easy and not very complicated. It is also not very expensive. Anglers can rent a boat and ply the inshore waters on their own. This is fun and adds a sense of adventure. The best option for anglers who can afford it is to go out on a Sarasota fishing charter. Capt. Jim Klopfer runs adventure charters and has been doing so since 1991. His experience fishing the Sarasota waters dramatically increase the success rate for his clients. Spinning tackle is the equipment of choice for most visitors fishing Sarasota Florida. Many of the baits used are light and spinning tackle is the best method of casting them. Also, majority of anglers are novices, including children. Spinning tackle is certainly the easiest equipment for them to be comfortable with. Fly fisherman can also do well. Any fish that will take a jig or other lure will take a well presented fly. Anglers fishing Sarasota Florida inshore have quite a few options. They can target action and variety on the deep flats and in the passes. More challenging fish such as snook in redfish are sought after on the shallow flats and along mangrove shorelines. Tasty bottom fish such as snapper and sheepshead are caught under docks and other structure throughout the area. Most of Sarasota Bay is fairly shallow. The maximum depth is around 10 feet. It has many acres of submerge grass beds. These are called “grass flats”. Grass is the primary cover for game fish and bait fish in Sarasota Bay. There is very little hard bottom view natural ledges. Therefore, fish will do most of their feeding in the submerge grass beds. Deep grass flats are submerge grass beds that grow in water between 5 feet deep and 10 feet deep. Anglers fishing Sarasota Bay on these deep grass flats will experience the most in terms of action and variety. Speckled trout are one of the primary species targeted on the deep grass flats. They are beautiful fish that are aggressive and taste great. Drifting the grass flats is a great way to locate schools of speckled trout. Anglers using live shrimp under a noisy cork do very well. Shrimp can be free lined behind the boat as well. Live bait fish are often used, particularly in the summer time. Chumming with live pilchards and threadfin herring is extremely productive. Bait fish are usually plentiful on the shallow flats near the passes. They are easily caught with a cast net. The bait is kept alive in a large well and is used both as chum to attract the fish and bait to catch them. Artificial lures such as a jig and grub, plug, or spoon will catch plenty of fish for those that prefer casting. The lead head jig and grub combination will catch fish anywhere on the planet. It consists of a hook with a piece of lead at the eye and a soft plastic body that imitates the crab or shrimp. One quarter ounce is the most popular size. These lures are very effective. It does not take long for even a novice angler to catch fish with them. Many other species are caught on the deep grass flats as well. 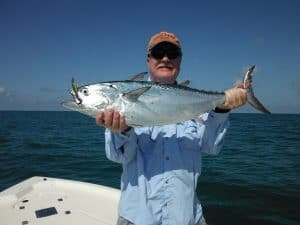 Spanish mackerel, bluefish, Pompano, jacks, ladyfish, grouper, snapper, catfish, sharks, cobia, flounder, sea bass, and other species are encountered in these areas at one time of year or another. The same lures, baits, and techniques that produce speckled trout will catch all these other species as well. Anglers seeking more challenging species such as snook, redfish, and jacks will target them on the shallow flats. These are areas between 1 foot deep and 4 feet deep. They are usually a combination of grass, sand, oyster bars, and mangrove shoreline. Artificial lures that cover a lot of water such as shallow diving plugs, weedless spoons, and soft plastic baits work well. Fish can be scattered and these types of search baits help locate the fish. Live bait also works on the species for anglers fishing Sarasota Florida. A large live shrimp is a great bait, especially in the cooler months. They work very well fished on the flats or under docks. 3 inch pin fish and grunts are good baits as well. In the warmer months pilchards are very effective baits. Many of the small Silver fish are caught using a cast net. They are then used both as live bait chum and as baits to catch fish. Sarasota has two passes, Big Sarasota Pass and New Pass. Both connect Sarasota Bay with the Gulf of Mexico. Pass is a term used on the Gulf Coast. It is basically an inlet. Both passes have good current flow and a lot of structure. They also have some of the deepest water around, up to 30 feet deep. These are ingredients for good fishing spots. Anglers fishing Sarasota Florida passes do so in a couple different ways. Drifting through the middle of the pass while bouncing jigs on the bottom is very productive. Ladyfish can be loaded up in the passes times and are great fun on light tackle. Pompano are a delicious and highly prized fish that are caught using this technique as well. Spanish mackerel, bluefish, jacks will also be taken. Live shrimp can be fished either free lined out behind the boat or near the bottom on a jig head. Deep water structure in the passes holds quite a few different species. Mangrove snapper are available all year long. Sheepshead move in by late January and stay until April. Snook school up there in the summer time. 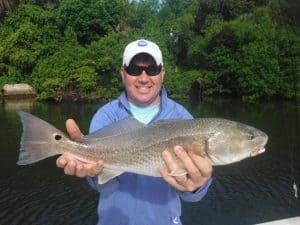 Redfish, drum, grouper, flounder, jacks, and other species may be taken there at any time. Live bait is generally the most productive when fishing these types of spots. Several rivers flow close to Sarasota that offer a unique angling experience. The Manatee River, Myakka River, and Braden River are all less than a 45 minute drive from Sarasota. 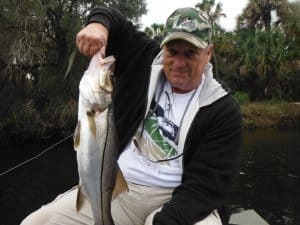 Snook migrate up into these rivers in the winter. Jacks, redfish, juvenile tarpon, largemouth bass, and other species are caught as well. It is a relaxing fishing trip with excellent scenery. The fishing technique and rivers is pretty simple. Clients cast shallow diving lures such as a Rapala towards shoreline cover as the boat drifts along with the current. Fallen trees and rocks will hold snook and other game fish. 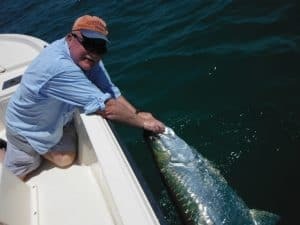 This is a Sarasota fishing charter that is best for experienced anglers. Some casting skill is required. It is also not a numbers game. The goal is a trophy snook. Capt. 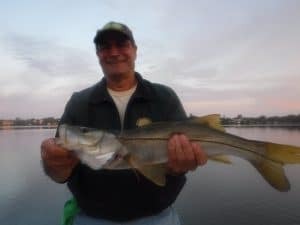 Jim is the only Sarasota fishing guide that offers this experience. The inshore Gulf of Mexico can offer world-class fishing to anglers visiting Sarasota. When conditions are right, the waters within a mile from shore will be teeming with bait and game fish. East winds will result in clear and calm water. This is a situation that is optimum. Pelagic species such as Spanish mackerel, king mackerel, and false albacore will migrate up and down the coast just off the Sarasota beaches. They are following the schools of sardines and herring that they feed on. 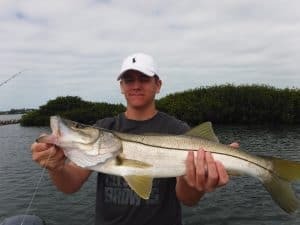 Anglers fishing Sarasota Florida can catch the species along with cobia and sharks in the spring and again in the fall. Spanish mackerel and false albacore will often times feed on the surface. These are called “breaking fish”. This is very exciting fishing is so much of it is visual. Schools of fish will be seen foraging aggressively on the surface, feeding on the hapless bait. Just about any lure, bait, or fly that remotely resembles the forage that they are feeding on will get taken. The fish are very excited and aggressive! King mackerel grow much larger than Spanish mackerel. They will seldom be seen feeding on the surface. However, quite often they will be hovering just below the melee. The best approach when targeting king fish is to troll a large plug or live bait around the edges of the big bait schools. Some of the largest king mackerel are caught quite close to shore. Giant tarpon show up off the Sarasota Beaches in mid May. Many consider them to be the ultimate angling challenge. There are very few opportunities to sight cast to fish over 100 pounds using spinning tackle. Again, this is a Sarasota fishing charter best suited to experienced anglers or hunters. That’s right, hunters. Tarpon fishing is as much fish hunting as it is fishing. Sighting the game and then stalking them is a big part of the fun and the challenge. There will be days when no fish are hooked. However, when it all comes together, it is nothing short of amazing! Sarasota County has an extensive artificial reef program. There are a dozen small reefs inside Sarasota Bay. Most of the reefs are out in the Gulf of Mexico. Three of these reefs are within 2 miles of shore, just off of Lido Key. They provide excellent fishing for pelagic species when they are around. Anglers bottom fishing do well on sheepshead, flounder, grouper, snapper, grunts, and other species. The waters offshore of Sarasota offer anglers quite a bit of variety as well. Bottom fishing for gag grouper and red grouper is very popular. Mangrove snapper, lane snapper, yellowtail snapper, Key West grunts, and triggerfish are also caught. Most of these fish are very good eating. Trolling produces king mackerel, blackfin tuna, and the occasional dolphin. Angling regulations change constantly. Current Florida fishing regulations can be viewed at the FWC website. 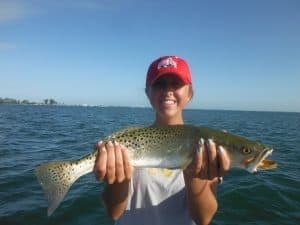 Anglers fishing Sarasota Florida for bottom fish target two types of spots. One is the previously mentioned artificial reef. These reefs are great fish holding structures. However, the numbers are published and everyone knows where there at. They get a fair amount of fishing pressure, particularly on weekends. The deeper the reef, the less pressure it receives. The deeper reefs and wrecks are the best spots to target amberjack. The best spots for anglers bottom fishing are natural ledges. Most of the floor of the Gulf of Mexico is barren of structure. The vast majority is just flat sand. Therefore any area of hard bottom or ledge becomes a fish magnet. Coral will grow their which will in turn attract smaller fish. This will obviously attract the larger game fish. Live bait fish and cut bait such as frozen sardines works well. Florida does require that all anglers fishing offshore you circle hooks to reduce fish mortality. Fishing regulations are constantly changing, see the current rules on the FWC site. Sarasota is not really known for its offshore trolling. The water simply does not get deep enough. At 30 miles from shore, the water is only about 100 feet deep. 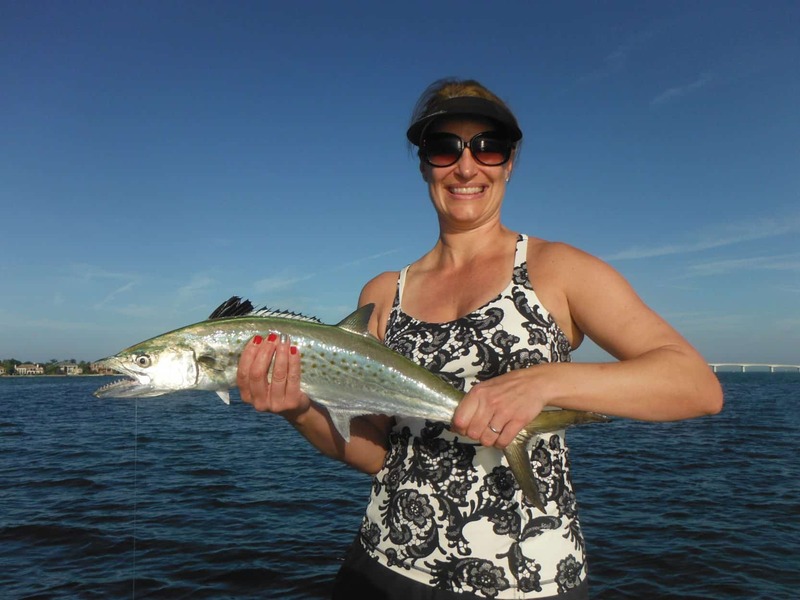 However, trolling does produce plenty of king mackerel in the spring and the fall. Most are caught between five and 15 miles from shore. Adventuresome anglers will travel a long distance offshore in search of wahoo and Bill fish. This is a game for the serious angler and safety is a big concern. Boats need to be an excellent working condition, have large fuel capacity, and angler should never venture out there alone. The reward for all this effort and expense is a big wahoo, sailfish, or even a blue Marlin! 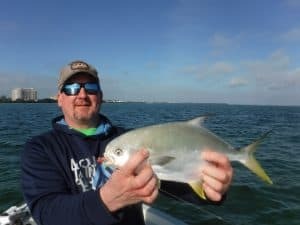 In conclusion, anglers fishing Sarasota Florida have the chance to catch many different species while enjoying a beautiful day in the Florida sunshine.